On 5 May 2016, a Tibetan monk, Lobsang Tenpa, from the Ngaba Kirti monastery was released after completing a two year prison term. Lobsang was arrested after peacefully protesting against repressive Chinese policies in Tibet by walking down a main road in the Ngaba County holding a portrait of his Holiness the Dalai Lama over his head, whilst calling for freedom and his return from exile. While in prison, Lobsang was reportedly subject to beatings and torture, a fate shared by other peaceful solo protestors; despite the fact his peaceful protest was fully in-line with his basic human right to freedom of expression. Yesterday, on 5 May 2016, Lobsang Tenpa, a solo Tibetan protester was released from a juvenile prison facility located in Chengdu city, Sichuan Province. He served a two year prison term for staging a peaceful solo protest against the repressive Chinese policies in Tibet. 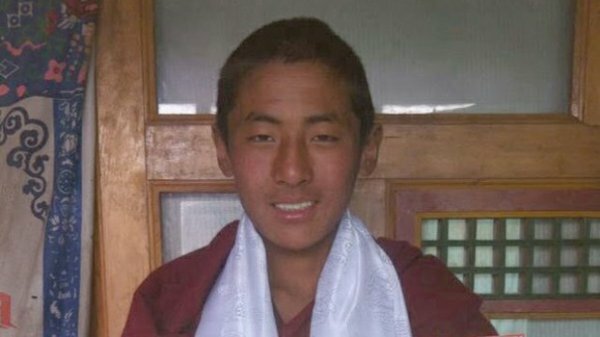 Lobsang Tenpa was 18 when he was detained on 26 April 2014 in Ngaba (Ch: Aba) County in Ngaba Tibetan and Qiang Autonomous Prefecture, Sichuan Province, in the Tibetan province of Amdo. Before his detention, he had walked down the main road in Ngaba County town holding above his head a portrait of the Tibetan spiritual leader His Holiness the Dalai Lama and shouted slogans calling for freedom and return of His Holiness to Tibet. After about eight months of incommunicado detention during which he was subjected to beatings and torture, the Barkham Intermediate People’s Court finally sentenced him on 7 November 2014. He was sentenced to two years for organising “anti-national activities”. His parents were allowed to observe his trial but were prevented from hiring a defense lawyer. Latest photos of Lobsang Tenpa, taken after his release, show that he was imprisoned in a juvenile prison facility located in Cuqiao, in the township of Wuhou district in Chengdu. At the time, Lobsang Tenpa was sentenced along with another Tibetan monk named Lobsang Gyatso who was sentenced to three years. Both monks belonged to Kirti Monastery in Ngaba County. Lobsang Gyatso had staged similar protest at the same spot on 2 April 2014 in Ngaba County. He had carried a handmade Tibetan national flag that he had made on his own and used it to stage his protest and to call for freedom and return of His Holiness to Tibet. He had escaped detention on the day of the protest but was later picked up from his monastery on 15 April by a group of Chinese police officers. TCHRD’s Political Prisoners Desk has recorded a total of 27 known peaceful solo Tibetan protesters since 2014, out of which six are laywomen. Majority of the solo protesters hail from the nomadic town of Meuruma in Ngaba County. A few of them have been released after being subjected to arbitrary detention, beatings and torture; many have been detained in secret locations and their current situation remains unknown. Among them, four have been sentenced to between 2 and 4 years in prison. The exact number of peaceful solo protesters is more than reported outside Tibet. Many of these protesters have been secretly detained and imprisoned. Chinese authorities have greatly increased the number of security personnel putting extreme restrictions on their movement and activities of local Tibetans. Many Tibetans continue to be detained and imprisoned secretly without the knowledge of the outside world or their family and friends. Online activities are put under surveillance and censored making it difficult to share information. The extreme surveillance and restrictions spawned by repressive Chinese policies have made it difficult to ascertain the exact number of solo peaceful protesters, let alone those who have been detained or unfairly and unjustly sentenced for exercising their freedom of expression and opinion. The acts of peaceful solo protesters do not violate Chinese law. Peaceful solo protesters are individuals who have lawfully exercised their basic human right to express their aspirations without resorting to violence. The right to freedom of expression is one of the most important conditions for the full realization of human freedom and justice. Chinese Constitution, even though meaningless due to its non-implementation, provides for the right to freedom of expression and assembly and other basic rights and freedoms. Despite these constitutional provisions, peaceful solo protesters have been routinely charged of ‘anti-national activities’ and ‘separatism’ and are subjected to arbitrary detention and imprisonment. The continued attacks on solo peaceful protesters demonstrate the extremely limited space for exercising basic human rights in Tibet. The repression unleashed by Chinese authorities in implementing policies aimed at assimilating Tibetans into the Chinese nation have led to the steady destruction of Tibetan religion, culture, language, environment, and native economy. These are the policies that sparked the 2008 uprising and later the series of self-immolation protests which saw over 140 known Tibetans burning up their bodies to shine light on Chinese repression in Tibet. The increase in Chinese police and military presence has coincided with the huge spike in self-immolation protests, as local Chinese authorities implement strict official directives and regulations calling for the collective persecution and punishment of a self-immolator’s family members, village, monastery, and the cancellation of government aid. This has further shrunk the space for any kind of expression, let alone assembly, forcing a growing number of ordinary Tibetans such as monastics, laymen and women, mothers, nomads and teenagers to express their aspirations through peaceful solo protests.